John Stewart is America’s funnyman and he seems to have a joke for every occasion. On Thursday night, the comedian took to the airwaves and announced that he didn’t have any jokes about the Charleston church shooting because it was just not funny. Stewart, who will be leaving his show later this year, instead used harsh language, including announcing that the shooting was a terrorist attack and that unfortunately nothing is going to change. The usually hilarious talk show host also talked about the fact that South Carolina still has streets named after confederate generals. He talked about the racial divide that is still clearly here and the damage that America can do to itself on “a regular basis.” Check out the moving video and tell us if you think John Stewart is right. 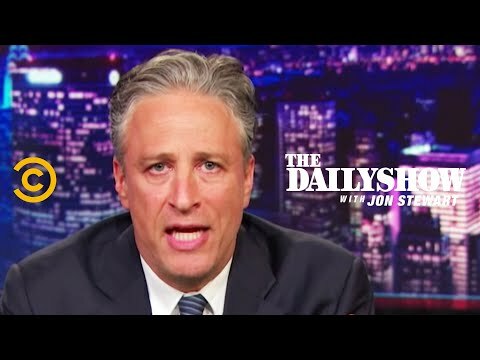 Remember when Jon Stewart blamed the confederate flag, right wing christians, and roads named after southern generals for the Dylann Roof shootings? A Nation of 320 million people, and once or twice a year there's a mass shooting; Jon Stewart calls it a "common occurrence"